Top Americans Sam Querrey and John Isner took much more treacherous paths into the Key Biscayne third round. Querrey dropped his opening service game but held 13 consecutive times to overcome Lukasz Kubot 4-6, 6-3, 6-3. The world No. 20 broke Kubot on four occasions, including at 5-3 in the third to finish off the comeback in style. 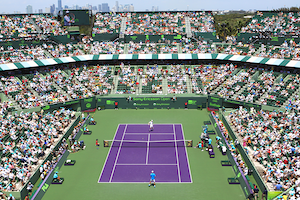 Speaking of serving big, Isner provided even more drama on the Grandstand–where he outlasted Ivan Dodig 4-6, 7-5, 7-6(5) in two hours and eight minutes. The 20th seed blasted 24 aces without double-faulting in a match that featured more momentum swings than any other in the tournament. Isner trailed by a set and a break in the second with Dodig two service holds away from a straight-set upset. The Croat, however, dropped serve at 4-3 and and 5-6 to throw away the set. A dispirited Dodig found himself down a break in the third only to enjoy a revival from out of nowhere to break back twice and even serve for the match at 6-5. A questionable call helped Isner stun Dodig in the 12th game of the decider and force a tiebreaker. Dodig eventually saved two match points on his own serve, but Isner finished off the thriller at 6-5 with a crushing service winner.